Be the first to hear about their new releases and deals. 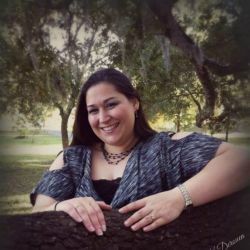 Download the Booksprout app and search for Lauren Tisdale today! Writing was not something that Lauren ever thought she’d want to do professionally. After becoming a mother, she stayed home to care for her son. In between diaper changes and nap times, Lauren found herself embarking on a journey of discovering herself through written word; with stories that somehow needed to be told, and characters who gave her glimpses into new worlds. It was there that she began her journey in fanfiction writing with a group of friends. Something sparked and a passion was lit. With many other independent authors as mentors, she grew and learned all she could to master her skills. What once was a hobby, led to a passion and then became a dream. Encouraged by her family and friends, she set out to pursue her writing, finally taking part in National Novel Writing Month, which brought forth her first novel – Circle of Secrets. Lauren is married to her husband of eleven years, Brett. Together they have one son, Payton and a lab retriever, Meeko. She calls a small town in south-central Louisiana home. Staying busy is what she's used to, but it keeps life interesting. She has a severe case of Wanderlust.